In order to achieve gender equality and empowerment of women and girls in science, and to achieve their full and equal access to and participation in science, the United Nations declared 11 February of each year the International Day of Women and Girls in Science. On this day, UN Secretary-General António Guterres urged more commitment to end gender bias, greater investments in science, technology, engineering and math education for all women and girls as well as opportunities for their careers and longer-term professional advancement so that all can benefit from their ground-breaking future contributions. Women scientists face a wide range of barriers ranging from family and social expectations to limited networking opportunities to lack of recognition for their work and targeted leadership programs. These challenges limit women’s opportunities in different fields especially in the field of science and technology. Along with a number of donor agencies and partners, the International Center for Biosaline Agriculture (ICBA) works to build the capacity of young women scientists in different countries. Empowering women is at the core of ICBA’s efforts. This idea guides different ICBA-managed programs like the Young Arab Women Scientists Leadership (Tamkeen) program, which is the first of its kind in the Middle East and North Africa (MENA) region. The program is supported by the Islamic Development Bank (IDB) and the Bill and Melinda Gates Foundation, and, when launched, will provide leadership opportunities, peer and mentor relationships, and contribute to the long-term goal of increasing women-led research into improved food security. 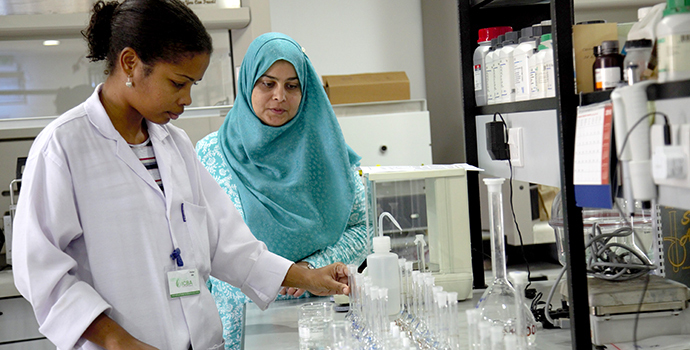 “We need to give priority to equipping women, namely women scientists, with necessary knowledge, skills and tools so that they can realize their full potential and contribute more to their countries’ economies,” said Dr. Ismahane Elouafi, Director General of ICBA, of the Tamkeen program. Under Dr. Ismahane Elouafi’s leadership, the center also works to be more inclusive and diversify its research staff by including also more women researchers, representing different cultures and nations. Her long-term commitment and contribution to promoting science and innovation, especially among Arab women, recently won her the prestigious Arab Women of the Year 2016 award. On the occasion of the International Day of Women and Girls in Science, some of women scientists at ICBA shared their views.